To make croutons: Preheat oven to 375 degrees. In a large mixing bowl, whisk together cornmeal, flour, sugar, baking powder, baking soda and salt. In a separate bowl, whisk together milk, oil and eggs until combined. Pour wet ingredients into the dry, just until combined. Pour mix into a greased 8x8 baking dish. Bake 16-20 minutes, until toothpick inserted into the center comes out clean. Allow to completely cool. Remove cornbread from the baking dish and cut into cubes. Heat oven to 400 degrees. Place on a greased baking sheet. Lightly toss in olive oil and sprinkle with a little salt. Bake 10-15 minutes, until crispy and lightly browned. Remove and allow to slightly cool. To make pulled pork: Place pork shoulder in the bowl of a greased slow cooker. In a small bowl, whisk together chili powder, coffee grounds, cumin, smoked paprika, salt and black pepper. Rub half the spice mixture on all sides of the pork shoulder. Pour about ½ cup water or stock in the bottom of the slow cooker. Cook on high 3-4 hours or low 6-8 hours, until pork is fork tender. Remove bones and any excess fat. Transfer pork to a cutting board and shred with forks into bite sized pieces. 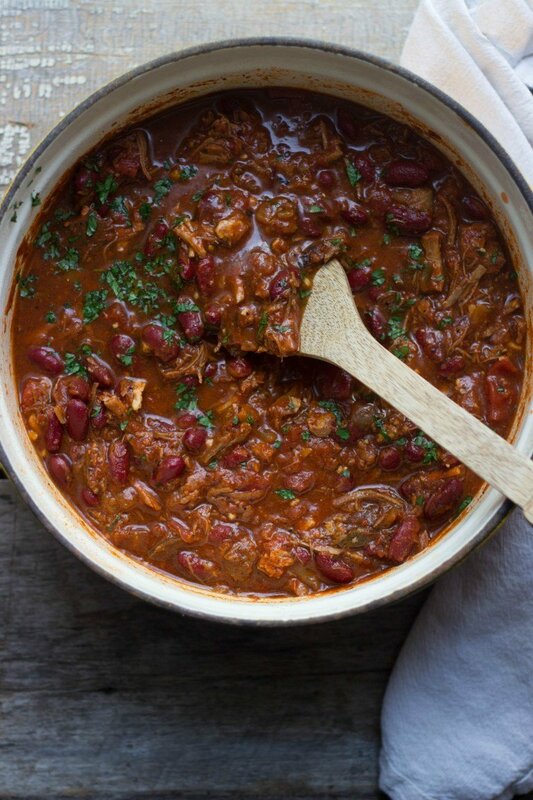 To make chili: Heat oil in a medium stock pot or Dutch oven. Add onion and saute 4-5 minutes, until soft. Add garlic and saute 30-60 seconds. Stir in remaining spice mixture, pork pieces and adobo sauce. Add crushed tomatoes, diced tomatoes, kidney beans and stock. Bring to a simmer and cook 15-20 minutes. Season with salt and pepper to taste. Add additional chili powder, if needed.